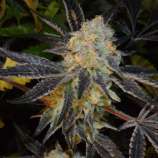 Here you can find a strain description about Pegasus and also some user-based reviews and infos directly from the SeedFinder (if available). You can also find the offers and auctions here if Pegasus cannabis seeds are on stock at MyCannapot right now. PEGASUS brings potent frequencies from the heavenly abodes. The winged stallion of antiquity carries lightning bolts for Zeus. PEGASUS inspires majesty and potency. Explore the fruit and floral essences of the Purple Elephant x Grape Stomper / Aloha White Widow (Genetics dedicated to our mentor  Jojorizo R.I.P.) blended with the heavy-hitting diesel, OGKB funk of the Grateful Breath. Every seed contains the possibility of majestic flowers. Buy Pegasus now at MyCannapot!